The undersea world contains thousands of beautiful creatures and plants. Perhaps the most stunning of all of them is the humble Nudibranch which means ‘naked gill’. There are over 3,000 different kinds of nudibranchs all over the world. Nudibranchs and their snail-related cousins form one of the main divisions (Subclass Heterobranchia) within the Mollusca. In many marine opisthobranchs, including nudibranchs, the shell is present during the larval stage, but disappears in most during metamorphosis. Heterobranchs are found in nearly all reef habitats. They occur from tide pools down to the greatest depths penetrated by Scuba divers. They are seen both in the open and under rocks and coral slabs. The key to finding them is to look for their favorite foods. 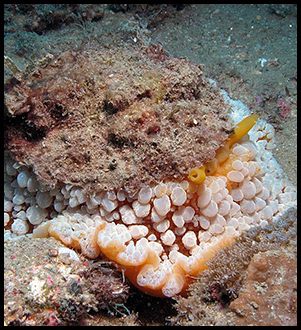 The majority of species feed on algae, sponges, bryozoans, ascidians, and cnidarians. Sea hares (Anaspideans) and Sapsuckers (Sacoglossans) are primarily algal feeders. Compared to most opisthobranchs the Sea hares of the family Aplysiidae are veritable giants. Some species reach a length of 400 and 500 mm! The average nudibranch is between 3 to 300 mm in length. 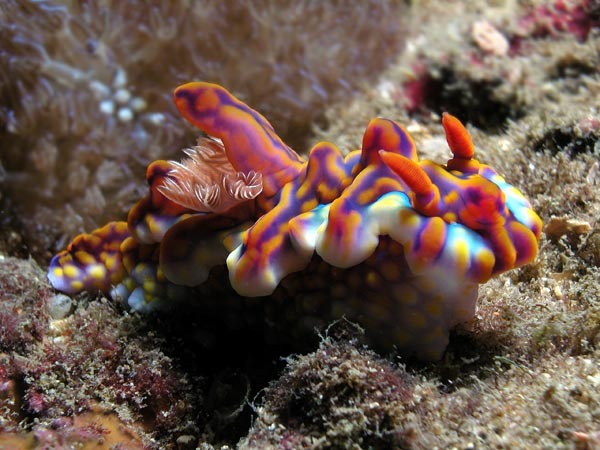 Most of the colourful opisthobranchs seen on coral reefs belong to the Order Nudibranchia. They are commonly known as Nudibranchs. This large group can be divided into four main types (Suborders) on the basis of their general appearance. 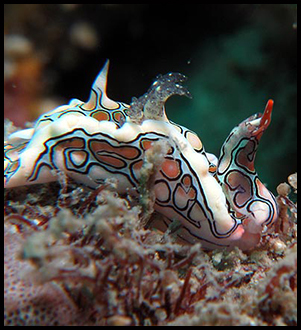 The harlequin nudibranchs (Doridaceans) are by far the most numerous. Most are characterized by the combination of a pair of tentacles (rhinophores) on top of the head and a tuft of feathery gills on the rear part of the back. However, certain species, known as phyllidiids, lack conspicuous gills and have lumpy ridges on the back. The Tubercular nudibranchs (Aeolidaceans) are second in abundance and the easiest group to recognize. They are covered with numerous finger-like appendages. 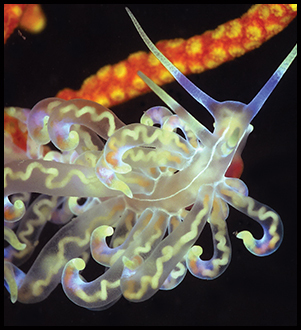 The Back gilled nudibranchs (Dendrotaceans) have several feathery gills along each side of the back, as well as a cup-like sheath around each tentacle on top of the head. 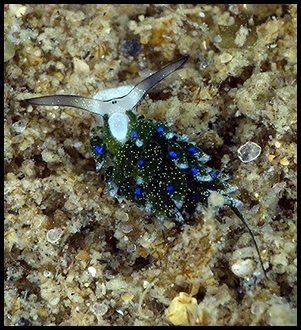 The last group, the Veiled nudibranchs (Arminaceans) is characterized by an expanded fleshy lobe on the head and longitudinal ridges along the back. How do these bright coloured, slow-moving creatures escape predators? Nature’s ways are frequently ingenious and the protective devices employed by nudibranchs are clever indeed. The flesh of opishthobranchs is frequently toxic or distasteful due to various chemical secretions. The bright “poster coloured” patterns serve to warn potential predators of their inedible qualities. These colours have most likely evolved in response to the threat of fish predators in view of their intelligence and visual acuity. 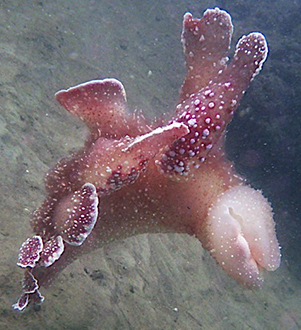 Once a fish inadvertently samples a sour nudibranch it is not likely to forget this experience. In subsequent encounters the nudibranch’s bold color pattern serves to remind the fish of its inedible qualities and it is ignored. Nudibranchs and their relatives also utilize camouflage colours to escape detection. 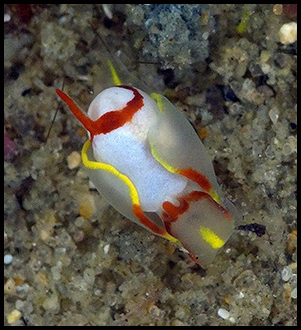 Some other harmless marine animals such as the juvenile Egg Cowrie Ovula ovum (below right) mimic nudibranchs such as Phyllidia madangensis (below left) to deceive predators. Species found among seaweeds, sponges, and on various cnidarians often effectively blend with the surroundings. The Tubercular nudibranchs possess a most unusual form of protection. Most species feed on various hydroids and other cnidarians. They are able to ingest the stinging cells (nematocysts) of their prey without firing them. The nematocysts are then incorporated into their own tissue. Thus, the tips of the finger-like projections covering their back, are armed with stolen weapons. 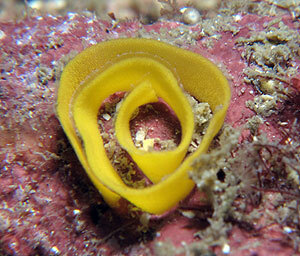 Both sexes are present in a single nudibranch, but self-fertilization does not occur. Special sperm sacs are exchanged during copulation. However, it may take several days, or even weeks before the eggs become fully developed and are actually fertilized. They are deposited in colorful, ribbon-like strands, often on the favored food. So the next time you are out snorkeling or diving keep an eye out for the beautiful Jewels of the Sea! Reference and thanks to the Indo-pacific Coral Reef Field Guide. 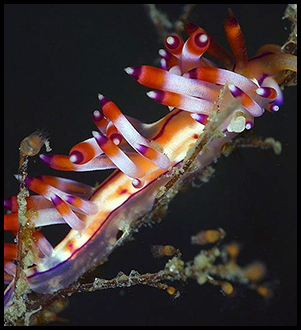 Very few nudibranchs have a universally recognised English common name, apart from the very largest ones, the Spanish Dancer and the Blue Dragon. 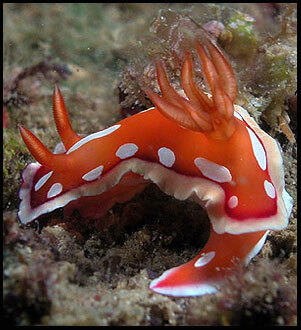 However, all nudibranchs have a unique scientific name, which is recognised the world over. All appropriately described organisms on earth usually have a Latinised form. ( ) Bracket convention Changes of scientific names are inevitable and they often upset or annoy the uninitiated. There is one simple way to recognise that changes have occurred. Under the international set of rules in Zoology the author’s name is put into brackets when the species name is changed to a genus different from that in which it was originally described. For example Doris sanguineus Rüppell & Leuckart, 1830 becomes Hexabranchus sanguineus (Rüppell & Leuckart, 1830) when it is recognised formally that the species belongs in Hexabranchus. Nudibranchs are amongst the most ephemeral of marine creatures. Seldom will one be able to visit a location with the intention of finding a particular species and locate it successfully. Nudibranchs tend to be rare in time and space. For example, the aeolid Babakina caprinsulensis was described, on the basis of a single specimen (collected in 1965) , from Leigh, New Zealand and no further specimen has been found subsequently despite thorough searching. So far as is known the maximum life span for a nudibranch is one year or less (even in the case of "giant" species such as Hexabranchus sanguineus and Melibe mirifica which, as adults, can reach 250 and 300 mm respectively). Their lives are superbly geared to the cycles of abundance of their foods. Those nudibranchs that feed on slow-growning organisms that are common and "predictably present" live for about a year (e.g., those that feed on sponges, sea anemones, gorgonians, sea pens and some bryozoans). In contrast, those nudibranchs that eat transitory organisms (such as hydroids or bryozoans that bloom briefly in marine fouling associations) have very rapid life cycles lasting only six weeks or less. For example, Fiona pinnata can grown from 8 mm to maturity (approximately 20 mm) in only 4 days and the tiny North American Doridella obscura can complete its life cycle in 26 days. All nudibranchs are functional hermaphrodites, so they can mate with any other mature individuals they encounter (they never normally fertilise themselves). After copulation, which lasts from a few seconds to a day depending on the particular species, each individual lays one to half a dozen spawn masses; the animal spirals anticlockwise or weaves about its food as it is laying its eggs. A typical nudibranch spawn coil is shown on the left. Some larger nudibranchs are capable of laying up to a million eggs. The eggs hatch either as minute larvae (complete with shell and operculum - see above) that swim in the plankton to feed (planktotrophic development), or directly as miniature adults (lecithotrophic development). There is a greater proportion of nudibranchs with lecithotrophic development in polar seas. The planktonic larvae (known as veligers) usually require contact with a suitable food organism before they settle and metamorphose into tiny adults. 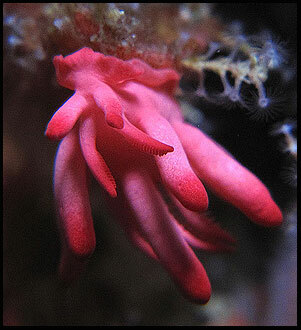 Because their lives are so short, growth of nudibranchs is exceedingly rapid, particularly in warm waters. Few studies have been done to follow the growth of nudibranchs because of the difficulty of individually marking (tagging) them. A few special (such as Goniobranchus splendidus) possess colour patterns that are unique for every animal, as personal as finger prints, so they would appear to be the best candidates for growth studies. Unfortunately there is no satisfactory technique for retaining the shapes and vivid colours of living nudibranchs. They are, therefore, not amenable to storage in a collection as one would do with sea shells. Nudibranchs must be studied live. Their fragile bodies mean that special techniques must be employed if they are to be collected and kept alive. In the field, whether it be a rocky seashore or a diving site, it is best to take a plastic (never glass) screwtop container to collect the specimens in. Suitably sized containers hold between 75 and 200 ml of seawater and can be conveniently stowed in the pocket of a diver’s buoyancy vest or tidepooler’s coat pocket. It is surprising just how much agitation nudibranchs can withstand. Do not be alarmed if some species release bright coloured fluids upon collection; none are harmful. These fluids can kill other nudibranchs, so they should be washed from the collecting container. 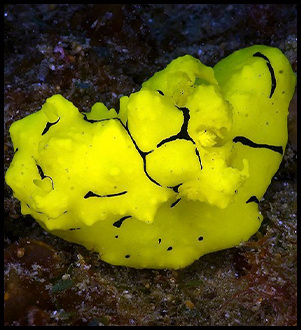 Avoid placing sea hares (particularly Aplysia species) or Phyllidia species in the same collecting container with other nudibranchs. 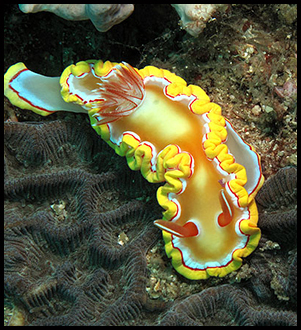 Both produce offensive-smelling secretions that kill other nudibranchs, invertebrates and even small fishes. Similarly Gymnodoris species should be kept apart because they readily eat other nudibranchs. Never overcrowd your collecting jar and wash the specimens into a large, sealable container such as a bucket for the journey home. Change the water several times during transportation and keep the container cool (a "chilli-bin", "eski" or vacuum flask is useful for this purpose). At home your specimens can be studied at leisure in an aquarium. They should stay alive for up to a month and you can observe crawling behaviour (many are able to crawl upside-down on the water’s surface), mating and egg laying. Unfortunately few species can be kept for their full life time in aquaria because their foods (particularly sponges, hydroids, ascidians and bryozoans) do not fare well in captivity. If you live near the sea you can collect small, fresh samples to feed to your animals, but large amounts (particularly sponges) will soon pollute the whole tank. There are a couple of exceptions however, Austraeolis ornata and Pleurobranchaea maculata can be kept for very long periods on a diet of fresh bivalve meat or small pieces of fish. Regrettably most nudibranchs get smaller and smaller as their bodies’ energy is channeled into reproduction – they will lay several spawn coils. Underwater photography permits an accurate record to be made of the specimen without it being collected. 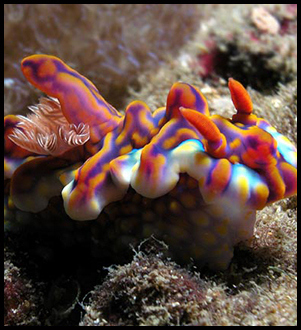 Most nudibranchs can be identified from colour photographs alone since their shapes and colours are so distinctive. However if your specimen is new to science it cannot be described from a photograph. 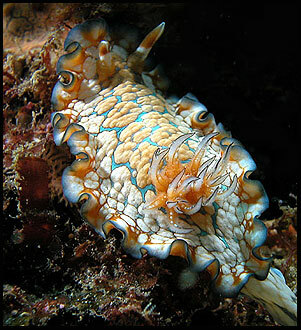 A close-up lens and flash light are needed for macro work of most nudibranchs. This system has the advantage of not collecting the specimens, it is the most accurate method to record colour and it allows many specimens of the same species to be photographed to obtain records of colour variation. If you intend to preserve your specimens they should first be relaxed to retain, more or less, their original body shape. The simplest relaxing agents are magnesium sulphate, magnesium chloride or menthol. It is better to add a few crystals (or drops) of 10% magnesium chloride solution often than a large amount at once. This causes the specimen to contract as badly as if it were put directly into a preservative fluid. Other suitable, but less commonly used, mild relaxing agents are propylene phenoxetol, chloral hydrate and chloretone. It often helps to chill the specimen in a refrigerator during the narcotization process. When the specimen is properly relaxed it should not respond to the touch of a needle; this takes between 12 and 24 hours. Be watchful, as death soon follows narcotization and the nudibranch’s tissues then disintergrate. Nudibranchs can be preserved in 10% neutral formalin or 70% ethyl alcohol. The former is preferable because it keeps the tissues in better condition for dissection. However formalin produces unpleasant and corrosive fumes. Therefore, ideally, the specimen should first be placed in formalin for one to two weeks, then washed and stored permanently in 70% ethanol. Never use metal-topped jars for storage of specimens because they are certain to rust. Always place a label in the container with the specimen stating location, depth, collector and date. Incidentally, these same data should be written on any slide or photograph of the specimen. It is desirable for research to have both the preserved speciman and a colour photograph of it alive. Since nudibranchs contract their bodies when they are preserved, the final length will be much less than the actual length in life. Just as fisheries biologists have agreed on a standard way to measure fish lengths (snout to caudal peduncle), so most nudibranch workers have a standard for measuring lengths of their specimens. They measure the distance from the front of the head (between the rhinophores) to the hind end of the mantle. When the mantle merges into the tail (as in the Polyceridae, aeolids and dendronotaceans) the distance is measured to the tip of the tail. Measurements are always taken from a specimen that is extended and crawling actively in a straight line.